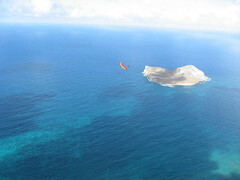 Just want to say a big Mahalo to Jetflap Jeff and Fireman Dave for putting on a little acro show the other day. Unfortunately didn't get many pictures, but had a great time watching them throw some SAT, asymmetric spirals, & nose down spirals. It's always good to see such talented pilots winging it around - gives you an idea what the possibilities are if you're willing to push the envelope. I was more fortunate. Here's a whole bunch of Fireman Dave. That is an awesome array of shots Tim, I am going to have to get a few from you.